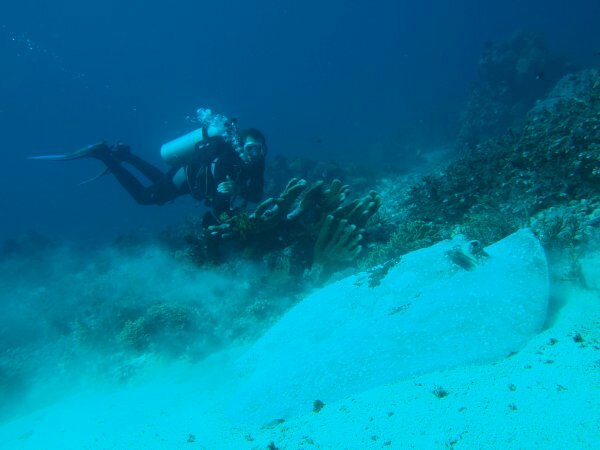 There are several beautiful dive spots on the north Coast of Flores Island in the Maumere Bay, around the Islands Pulau Besar, Pulau Babi, Pangabatan and Pamana a big diversity of marine life exists. Coral reefs, walls and slopes developed after the tsunami in 1992 and now they are even more beautiful and colourful than before. It's easy to see reef fish, and have encounters with sharks, and occasionally dolphins and mantas. Macro life is really interesting, finding many species of nudibranches, some of them not even catalogued yet. Until 1992 the bay of Maumere was one of the top dive sites in Indonesia. In a report on the bay of Maumere published in 1997 by Kuiter & Allen the incredible number of 1133 species of fish in this area could be proved. This is still the highest number of species ever counted inside a specific area. Marine Biodiversity is definitely among of the highest in Indonesia. In December 1992 a tsunami hit the coast and killed at least 2500 people. On Pulau Babi, an island in front of Maumere, the 30-m-waves killed 1000 people. Fortunately there were no divers under water when the earthquake happened. However after the tsunami Maumere had difficulties regaining its former status as top dive destination. Divers stayed away and the famous dive centres went out of business.